This page is to document the creation of a Juicebox cartridge that contains a custom bootloader, uclinux kernel, and ramdisk which can be used with any unmodified juicebox. after doing some initial tests with a smartmedia card, i had enough info to build a usable cartridge. this modification is based on the SD/MMC Cartridge, aka MP3-kit], however it also can be done with standalone components. first step is the open the JuiceBox MMC cartridge are remove the pcb. after removable you will need to cut three traces(in red) and solder across two resistors(in blue). pin 12 of the card edge normally connects to pin 2 of the sd/mmc card, however we have cut this trace as it is used with the flash. 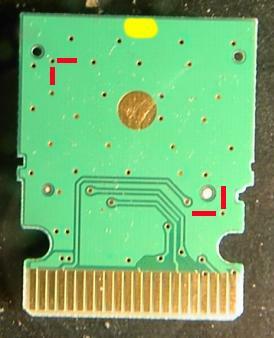 pin 2 of the sd/mmc will need to be connect to pin 6 of the card edge. pin 18 of the card edge normally connects to pin 7 of the sd/mmc card, however we have cut this trace as it is used with the flash. pin 7 of the sd/mmc will need to be connect to pin 2 of the card edge. these reconnections can be done by either soldering to the cut trace on the back side or using a small wire to go around to the front. soldering a wire to the front is easier and there is enough room along the sides of the case for the wires. normally the mp3 cartridge has pin 20 pulled down to ground(Vss) with a resistor, and the juiceware carts have pin 20 pulled up to Vcc(3.3) with a resistor. in order for the mp3 cart to now look like a juiceware cart we need to cut the ground trace that leads to R2(see photo) and then solder across R2 to R3. this then configures the custom cart to appear as a juiceware cart. since pin 1 on the pcb is so close the plastic enclosure, you'll need to make the connection further out on the pcb, so you will need to scrap clean some copper at the via hole just above pin 1 as noted in yellow on the photo. the ground on the other side , pins 19 and 21 have the same problem, so a copper area at the top of the pcb needs to be cleaned as well( see photo below). you will need an xD card for the next step. you will need to trim the edges of the card slightly so that it will fit inside the case. the plastic on each side is strictly for the socket guides and can be removed with a box cutter or xacto knife. you will need to mix up some epoxy to glue the xD card to the back side of the pcb. the picture has red markers for alignment. the pcb has small holes(via's), so when you glue the xD to the back let the epoxy dry a little before application and turn the pcb on its back during drying so that the epoxy does not go through the holes. failure to be careful with the epoxy will cause the epoxy to go through to the sd/mmc socket and make it unusable(doh and yes I'm speaking from experience). another option is to desolder the sd/mmc socket before doing the epoxy but thats only if you have the time and equipment handy. the contacts on the xD card are very close together and can be difficult to solder to due to solder bridges. before beginning to solder to the xD, use a box cutter or xacto knife to scrap in between the contacts to widen the space.you will need to tin the card edge contacts as well as the copper area that you cleaned earlier for pin 1 and for the ground area at the top of the pcb. the Vcc line ( pin 1 on the xD and pin 1 the card edge) needs to be soldered first as there is little room afterwards(doh doh). i used wire from an 80 conductor IDE cable, but tested with 40 conductor IDE cable and found that the wire was too big. to program the cartridge you will need a JuiceBox wired for the JTAG Interface] and Serial Console]. you copy the bootloader, kernel and ramdisk to the sd/mmc card. load the program_flash application into ram on the juicebox and execute it. this will copy the bootloader, kernel and ramdisk from the sd/mmc card and copy it to the flash. when finished, the cartridge is ready to use on any unmodified Juicebox. the program_flash application is currently being cleaned up for posting and will be GPL licensed. its based on the work of Joe Bleau with his JuiceBox Code Test. 1- Is the JuiceBox basically an SD/MMC + smartmedia/xD combined interface? the Juicebox has an cartridge slot that has enough address and gpio lines to operate a sd/mmc interface and a nand flash interface. 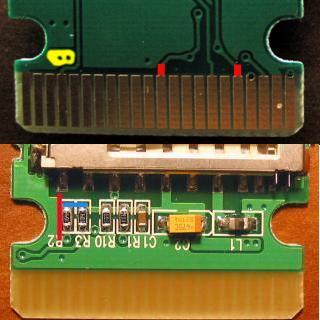 there are two types of cartridges available(until now), one is a cartridge with nand flash known as a juiceware cartridge. the other is a sd/mmc adapter cartridge known as the MP3 kit. smartmedia and xD cards are nothing more than nand flash in a removable package. all i have done is combine the two cartridges into one that has both nand flash and the sd/mmc interfaces. 2- Does the ROM bootloader in the JuiceBox first check to see if there is a XD/smartmedia cart inserted, and if so, tries to boot from it? technically it checks to see if a juiceware cartridge is present by checking a gpio line. the ROM bootloader doesn't really know anything about xD/Smartmedia its basically looking for nand flash. if the contents of the nand flash meet certain requirements its copies the contents to ram and jumps to that location to begin executing the program. 3- Why is the JuiceBox itself necessary to prepare the boot XD? Whatever it writes to the XD sure can be done from a PC with a standard xD/Smartmedia card reader. use a JuiceBox to program the card since it already has the nand flash interface. use a USB->SM/xD device that provides raw access. the only two known devices available currently are listed here - http://alauda.sourceforge.net/wikka.php?wakka=SupportedDevices , i've already modified the driver to program the SM/xD for use with the Juicebox, but as not everyone has one of these devices, i felt it was better to describe the process using the juicebox. build custom hardware. there are several schematics available on the net to build nand flash interfaces via the parallel port. these are rather cumbersome and the least desirable. 4 - I have inserted the modified cartridge into the JuiceBox and started it up in test mode. 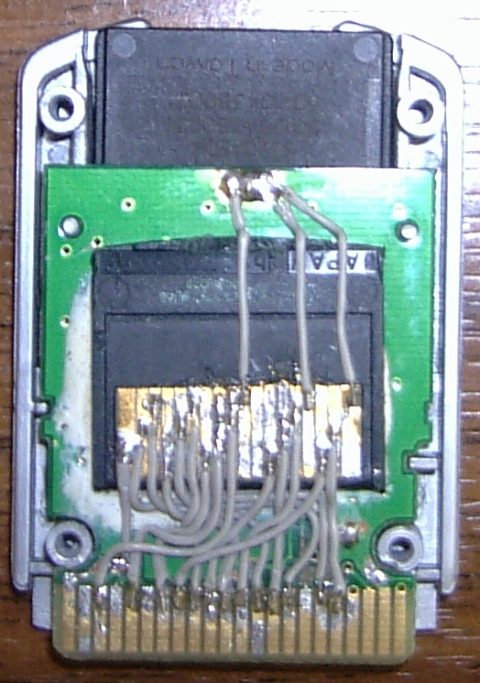 With a 32MB SD card in the socket and a 256MB xD card, the memory test shows no SD card and 4 cartridges of 256MB each. Is that what I should expect with the modification, or have I miswired something? This page was last edited on 11 April 2011, at 13:36.